During the dot.com boom, investors routinely bought shares of companies with no business experience, assets, or revenue. But how about a company with no employees, office space, customers or products? Sound like a tough sale? Would it help if I told you it was a “green energy” company? 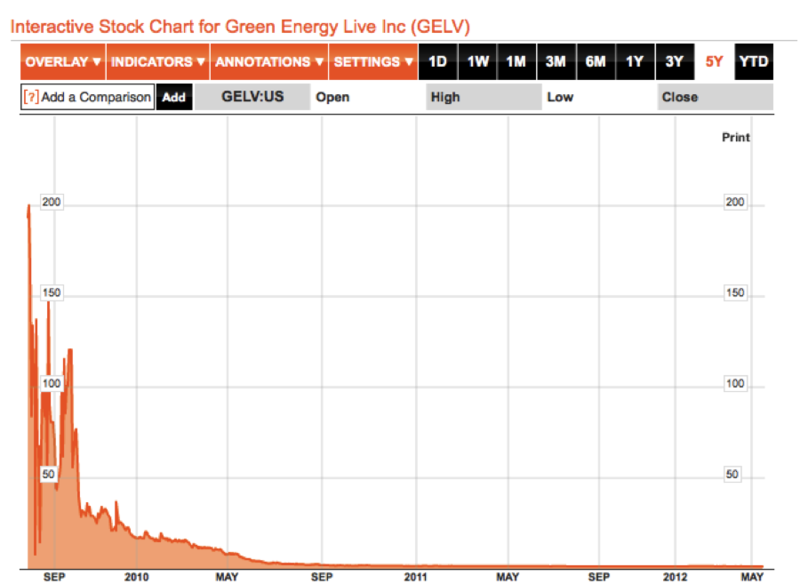 It turns out that this company, Green Energy Live, Inc., was a very bad investment. And this is why its promoter, Nicholas Louis Geranio, finds himself being financially regulated. Faced with an SEC fraud complaint, Mr. Geranio now appears to be settling with the SEC, with no admission of wrongdoing. More on this below. But first, recall that on May 16, 2012, the SEC filed a complaint against Geranio and his companies (The Good One, Inc. and Kaleidoscope Real Estate, Inc.) for his leading role in a $35 million scheme to sell worthless stocks of several shell companies to overseas investors. In summary, the SEC alleges that Geranio took control of a number of shell companies and put in place a nominal management, including a guy he met kite surfing in Malibu, and one Keith Michael Field, who served as “Chairman” of several of the companies. The companies, with their trendy and misleading names, were: Green Energy Live, Inc.; Spectrum Acquisition Holdings, Inc.; United States Oil & Gas Corp.; Mundus Group, Inc.; Blu Vu Deep Oil & Gas Exploration, Inc.; Wyncrest Group, Inc.; Microresearch Corp.; and Power Nanotech, Inc. Geranio caused these companies to issue securities under Regulation S, which exempts securities from SEC registration if sold only to investors outside of the U.S. In addition, Geranio instructed several colleagues to engage in matching buy and sell transactions in the stocks to establish a market price and create the appearance of active trading. This pumped up the stock prices and enabled the Spanish boiler rooms to falsely claim to be offering the shares at prices below “market.” The scheme raised $35 million, of which an incredible 60% to 70% was paid to the boiler rooms (an immediate 60% to 70% loss on investment). Geranio received $2.1 million as his cut. On or about April 22, 2010, the Company received written consents in lieu of a meeting of stockholders . . . [t]o increase the maximum number of stock that the Company shall be authorized to have outstanding at anytime to three billion (3,000,000,000) shares of common stock at par value of $0.0001. On July 8, 2010, 45,000,000 shares at a market price of $85,500 were issued in settlement of accounts payable of $17,000, resulting in premium costs for settlement of accounts payable of $68,500. The board pays company debts using dump trucks full of its own stock. This is a harsh reminder that one of the risks of owning individual stocks is that the corporate board itself can decimate the stock price by engaging in transactions that increase the number of outstanding shares without receiving fair value in return. Perhaps there is some small silver lining here. After all, pump-and-dump, boiler-room-driven fraud was once common in the United States, but its prevalence has waned over the last 15 years. This is some evidence that our securities regulatory system is working. Geranio apparently felt he would have better luck exporting this tried-and-true scam to a less hostile regulatory territory. Ultimately, however, he underestimated the reach of the SEC. According to the docket in the SEC’s civil case against Mr. Geranio, he appears to be settling the case. On August 19, 2013, the SEC filed a consent to entry of final judgment signed by Mr. Geranio on August 5th. Also settling are Mr. Geranio’s companies, The Good One, Inc., and Kaleidoscope Real Estate, Inc., and also the relief defendant BWRE Hawaii, LLC. Only defendant Keith Michael Field has not agreed to settle, but the SEC informed the court that serious settlement discussions are underway with Mr. Field. According to the terms of the proposed settlement, Mr. Geranio will not be admitting any wrongdoing – he is agreeing to have judgment entered against him, “Without admitting or denying the allegations of the complaint….” As readers of FinanciallyRegulated know, the SEC recently announced a new policy in which defendants will not automatically be permitted to settle a case without admitting any wrongdoing. There may be cases, said the SEC, where admission of misconduct is appropriate. This policy was recently seen in action in the SEC’s proposed settlement with hedge fund manager Philip A. Falcone (of Harbinger Capital Partners). Under the proposed settlement, Mr. Falcone will agree to admit a host of highly unfavorable facts. The defendants are barred from participating in penny stock offerings. For more details, see the consent to entry of final judgment. It remains to be seen how much of a recovery this means for investors, although we note that the SEC’s original Complaint referred to a “$35 million scheme.” Because of the settlement, we many never know the true scope of the alleged fraud. One thing is certain however: A Company With “No Employees, Office Space, Customers, or Products” is probably a bad investment. « Issuing Hundreds of False Account Statements is Not Okay, says CFTC. I purchased shares in both Green Energy Live and Power Nanotech. Now that Mr Geranio has been caught, what chance is there of the money I invested in these non-companies being returned ? None, zip, zero, zilch, nada. Perhaps the companies could compensate their investors by having their Boards approve another 2 billion or so shares and then issue each investor a few truck loads. In all seriousness, I hope you get something back Tom.